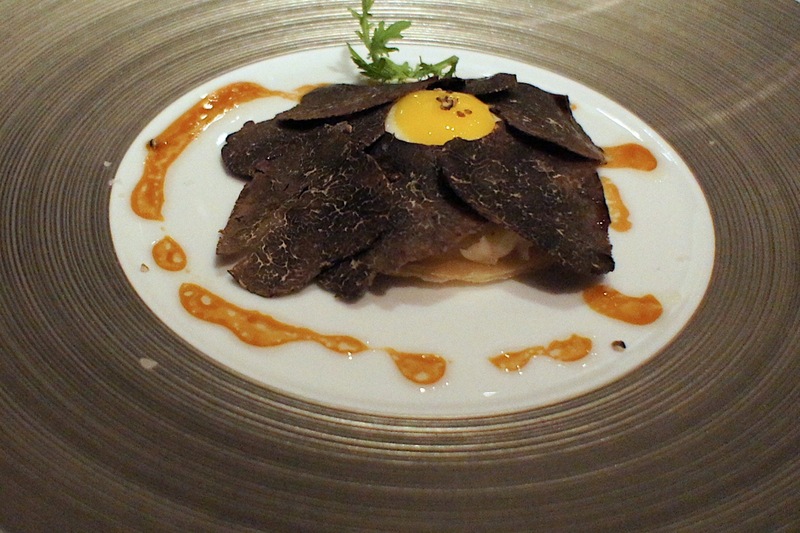 Update: Tim's Kitchen Macau lost its one Michelin star in 2013. 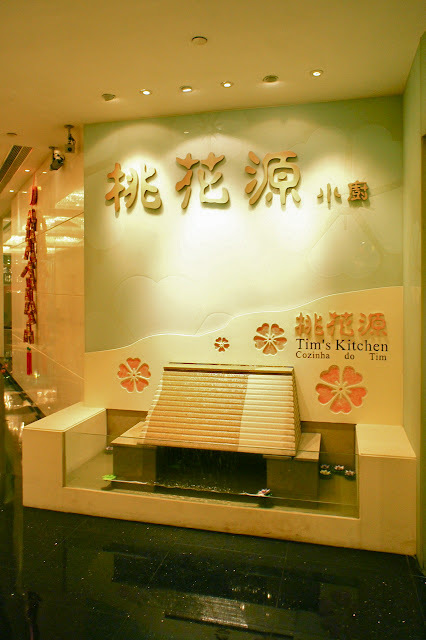 Tim's Kitchen is a 2-Michelin star chinese restaurant in Macau and is the sister of the similarly named restaurant in Hong Kong (see earlier review on Hong Kong's Tim's Kitchen: Tim's Kitchen Hong Kong). 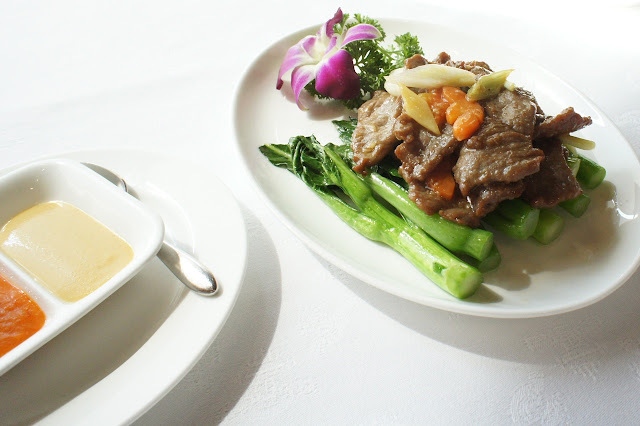 This is supposedly the better of the two, as Chef Lai Yau Tim has been known to spend more time at the Macau restaurant in recent years. 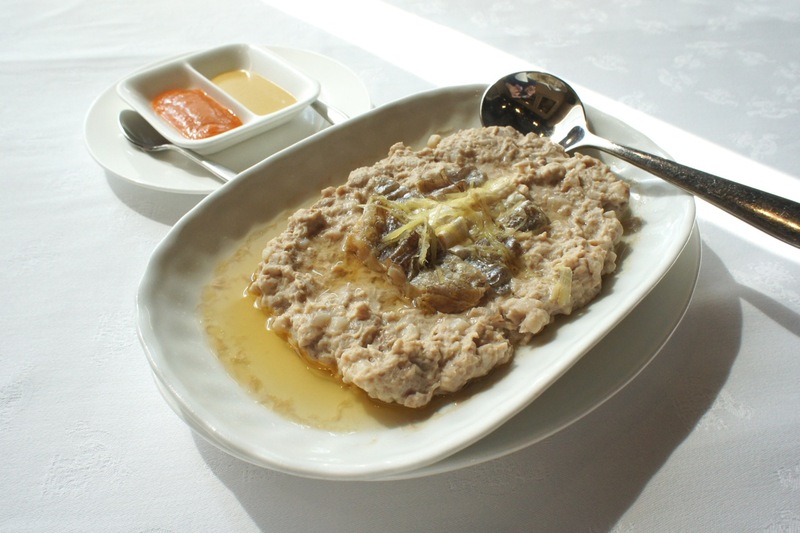 Our experience at the Hong Kong restaurant did not impress us too much, but with our friends and third party reviews raving about Tim's, we felt that we should give it another try to see what the fuss was all about. We came here for lunch, in the same hotel we were at the previous night for dinner at Robuchon. The decor is not impressive, as it was simple and quite old. Even the entrance was quite plain, with sakura floral prints adorning the sign board making it look at first glance like a low-end Japanese restaurant. We were given a large corner table by the window with good views of the lake (though the air quality in Macau was very poor and the views were partially obscured by the smog). We asked for the wine list and was pleasantly surprised when the waitress came over with the same massive wine list as in Robuchon. 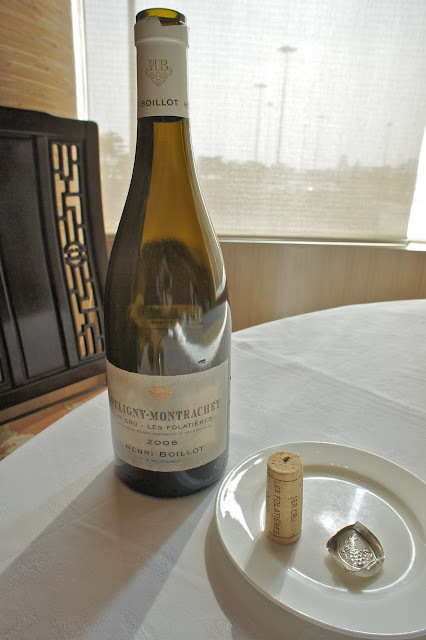 But this time, I was not offered the iPad and had to flip through the large book to pick up a 2008 Puligny-Montrachet Premier Cru Les Folatieres from Henri Boillot, which was a very nice Chardonnay complementing the Chinese food well. 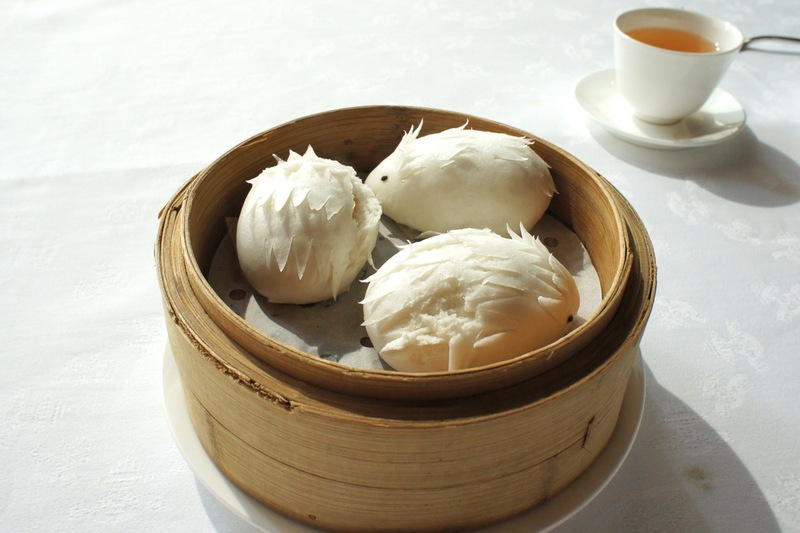 We were initially quite keen to order some dim sum, but fortunately we were told by the very friendly male waiter (who spoke excellent English) that the restaurant outsourced the dim sum to the Hotel Lisboa cafe and it was not made in Tim's. Initially, one of the waitresses came over and recommended most of the dishes we had the last time in HK, to our great reluctance. The male waiter then came over to our rescue again and helped us pick some of Chef Tim's other specialty dishes. 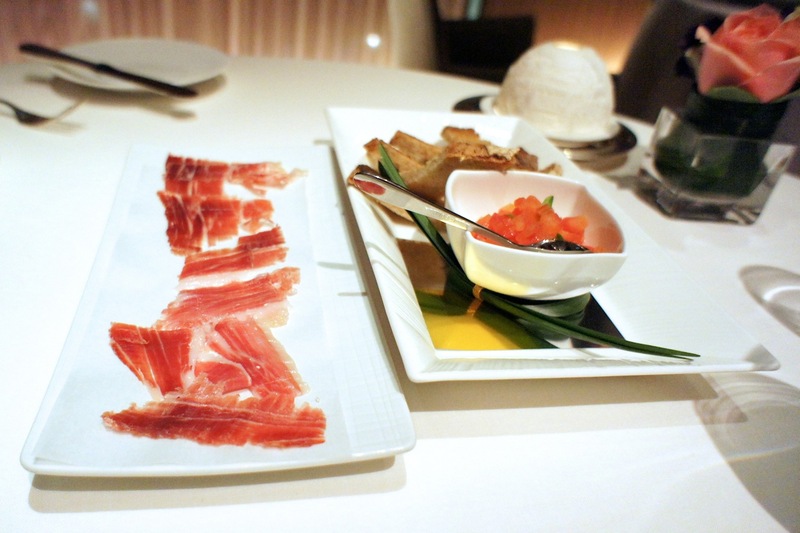 We each started with the crystal prawn (accompanied by a slice of pork jerky, which strong taste balanced out the subtle prawn), which was a large portion for one person. The prawn was snow white and was quite exquisite. 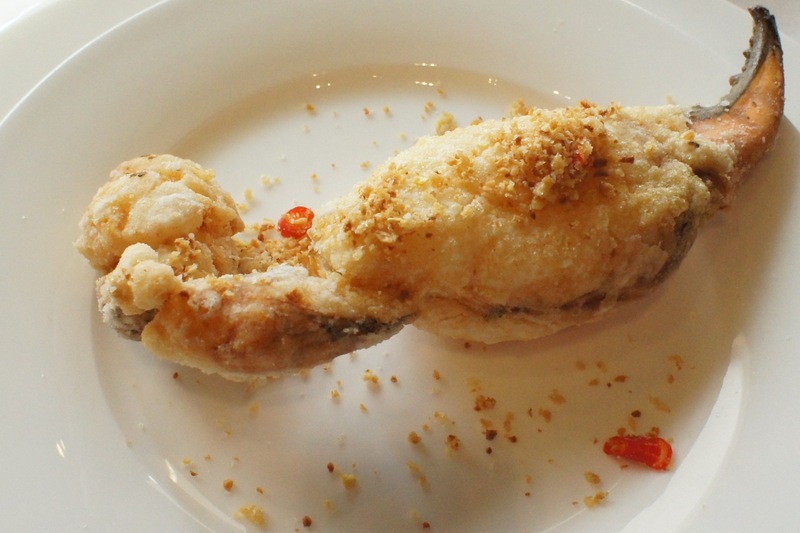 Next, we each ordered the deep-fried crab claw with peppercorn, which was another superb dish. This was one to die for. 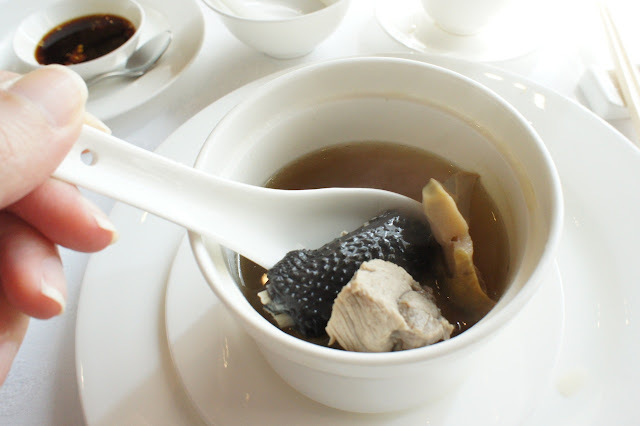 I had to try the snake soup with shredded snake meat, while my wife could not muster up the courage to try it and picked instead the black chicken consommé with sea whelk. Her soup was very good, while mine was also excellent. 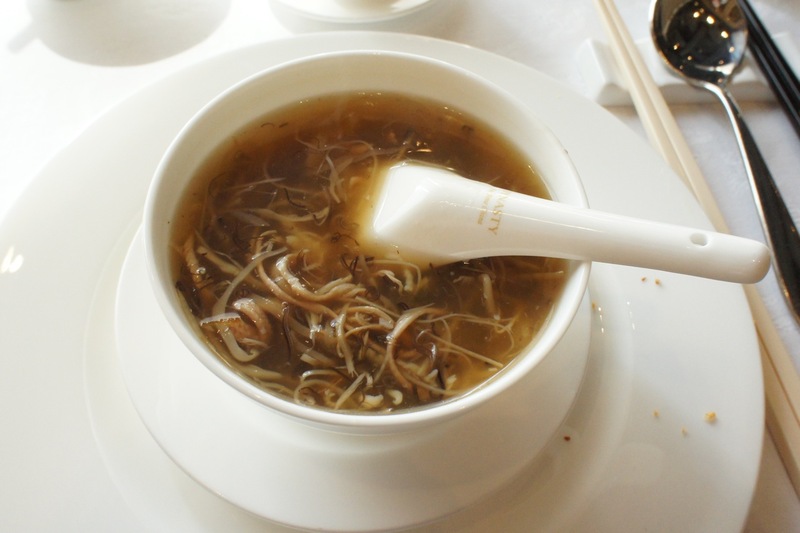 The snake soup and snake meat tasted like shark's fin but with a stronger taste. It was an intense soup which made me feel warm all over almost immediately (and caused me to have a sore throat after 2 hours). 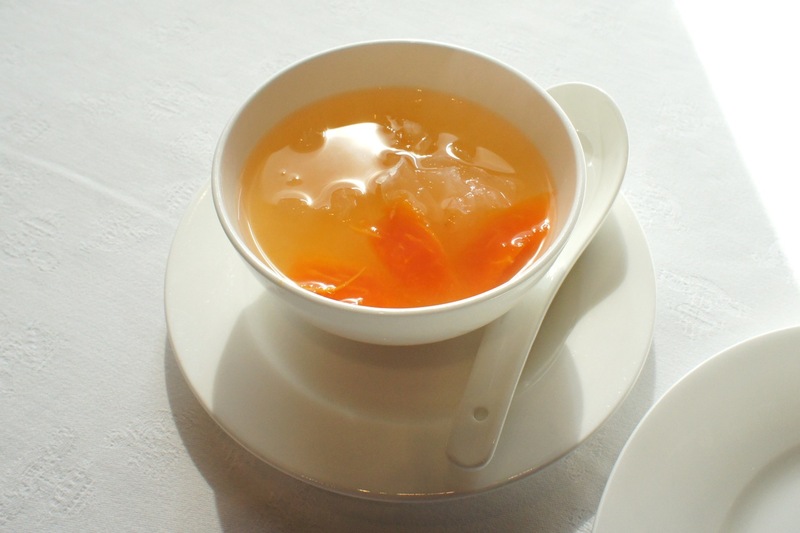 For dessert, we ordered the egg custard bun and papaya soup, which were also very good. The papaya soup was especially helpful in cooling me down after the very 'heaty' snake soup. We really liked this restaurant. It was a simple and unpretentious place but with delicious food and an impressive wine list. It was much better than the HK one (I managed to get the waiter to admit that it's not the first time he's heard this said as well). 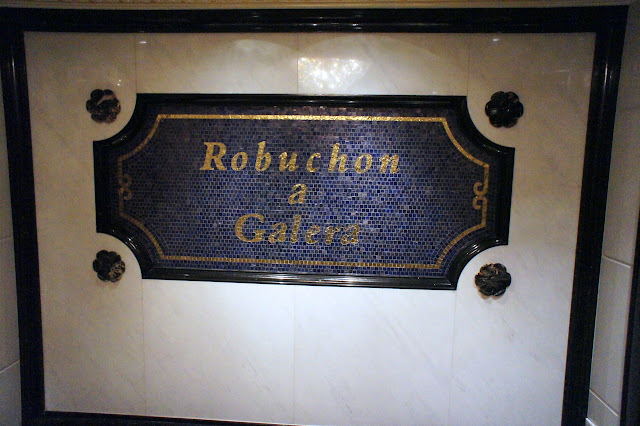 Robuchon is a 3-Michelin star French restaurant in Macau. 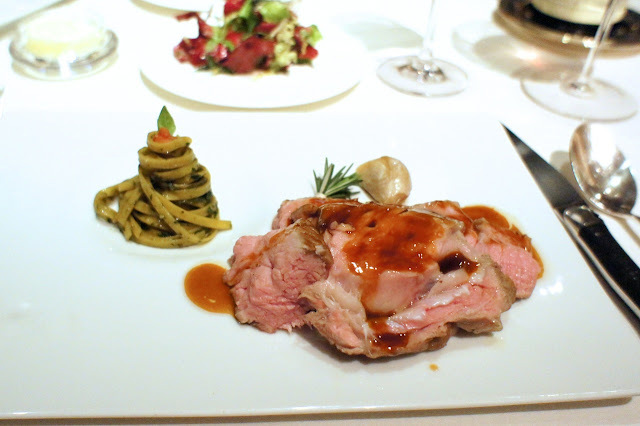 It is also recognised as one of the best French restaurants outside of France (certainly one of the best in Asia), and it was with this expectation that we went there for dinner. 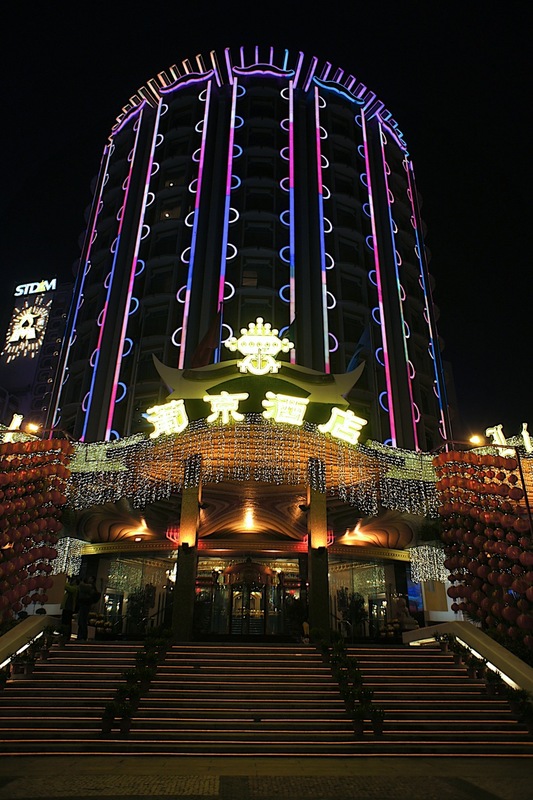 The restaurant is located in Hotel Lisboa, which is one of the older establishments in Macau. Hotel Lisboa (not to be confused with its newer but no less tacky sibling, Grand Lisboa) is well lit at night and looks right out of the set of a 70's Cantonese movie. 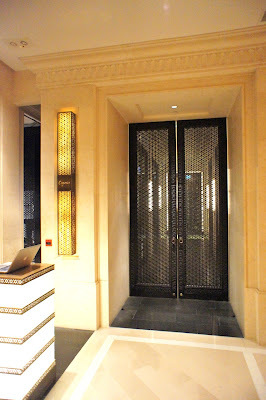 It was quite an effort to find the restaurant though, as the rather kitschy hotel had an east and west wing and omitted to put signs to direct us, which resulted in us walking around the small stores and KTV joints for 20 minutes before finally finding the right lift lobby. The restaurant itself has a rather dated decor (check out the glittering stars on the ceiling), though the tables are very widely spaced ensuring privacy for its diners. In fact, as the restaurant was not full that night (it was a Monday evening), patrons were deliberately placed as far apart as possible (which is a nice change from the usual bunching of all the guests together so that the wait staff don't have to move around so much). 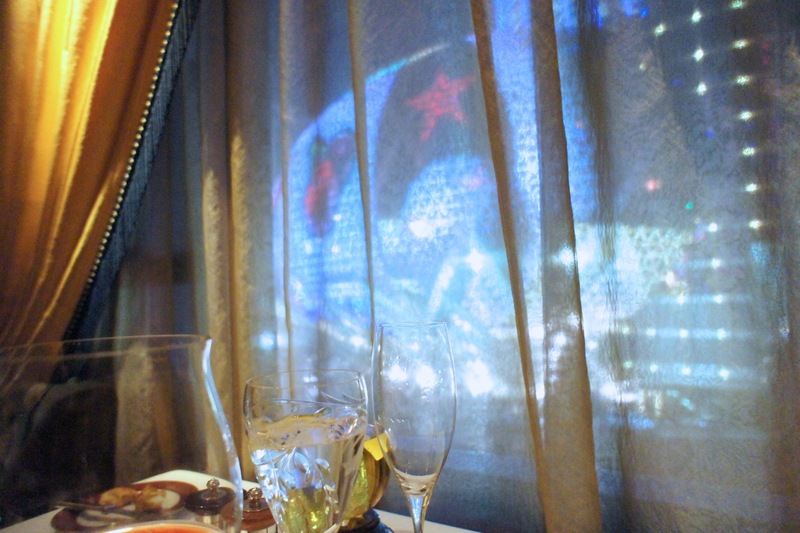 We were given a nice table by the window overlooking the bright lights of the gaudy Grand Lisboa casino, and offered champagne. In spite of the early 90's interior, we could not help but feel that this was a restaurant which was comfortable with its high standing. The service staff was excellent: in being confident yet respectful, discreet yet attentive. 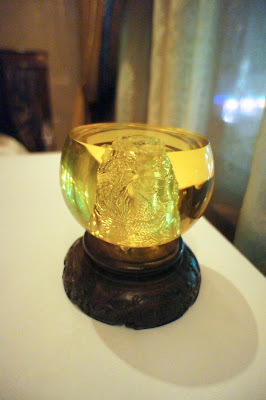 Interestingly, each table had a different geomancy crystal for feng shui. Our table had a gold crystal dragon which at some point during the dinner, inexplicably started to tick (maybe it was starting to work and our luck was going to be coming in). We didn't know whether to touch it or to cover it with the napkin (we did neither). As was to be expected from a Robuchon flagship, they take their bread very seriously. 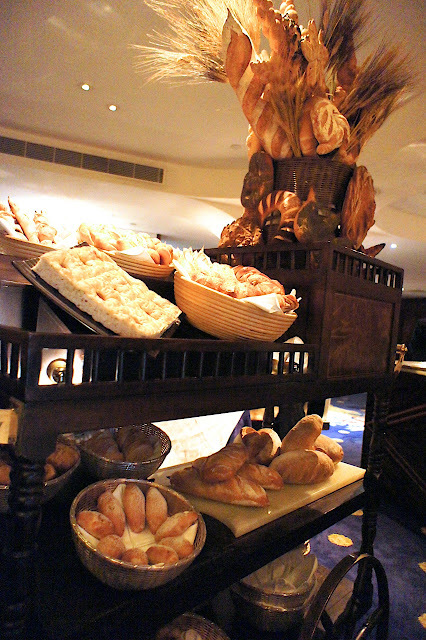 In addition to a plate of cheese puffs and olive breadsticks, they wheeled out a bread trolley from which we picked out some amazing bread. 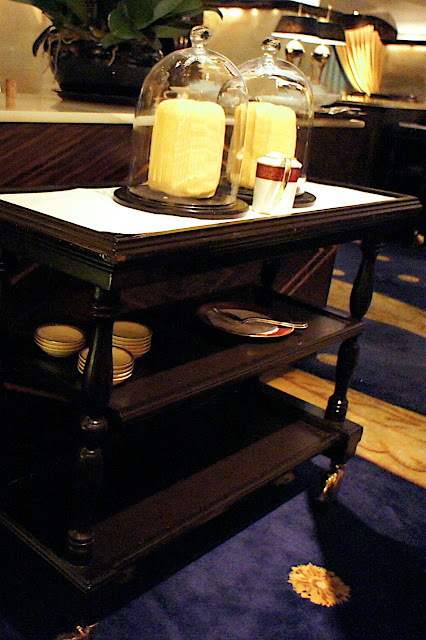 Butter was carved from two large blocks of salted and unsalted butters (largest block of butter we've seen). We had to be careful with the bread or dinner would have been over before we even started. The wine list here was amazing. It was literally a tome larger than the yellow pages phone directory, which was probably too heavy for me to hold and flip through in any case, thus it was sensible that they had an iPad version (a rare touch of modernity in a classical French restaurant). Forget about Cepage, this was the best and deepest wine list we've seen outside Europe (most top restaurants in Paris and London would struggle to match this too). In addition, the wine list had the full range of really high end stuff (wines like the Bordeaux first growths, Petrus, La Tache and the other DRCs had vintages going back to the 1940s) yet had a good range of the middle priced and low priced (under HKD 1000) wines as well, which was impressive. 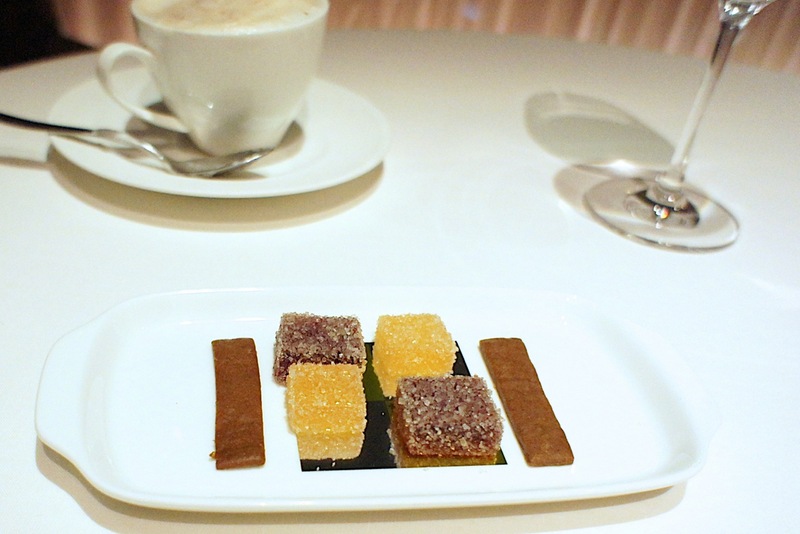 Markups were not as steep as we would have expected in a 3-star restaurant in a Macau casino. 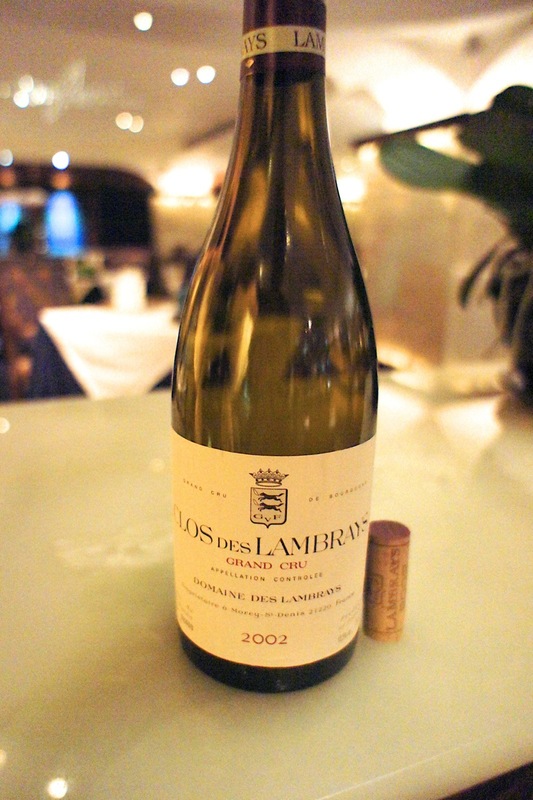 We picked up a bottle of 2002 Clos des Lambrays Grand Cru at the recommendation of the helpful sommelier. It was a soft and subtle Burgundy which opened up deliciously as the night wore on. 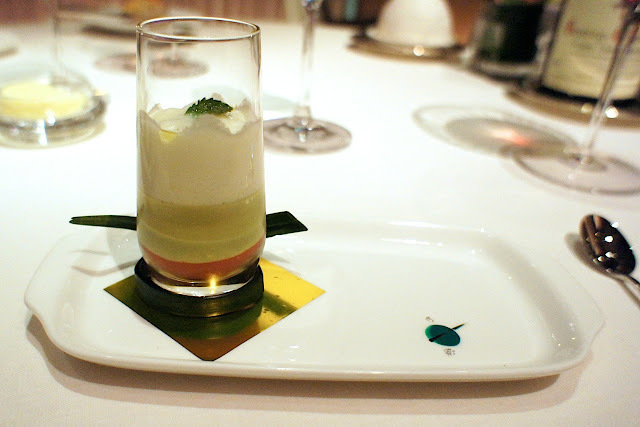 For our amuse bouche, we were wowed by the Robuchon signature caviar in a tin with the base of egg custard and shrimp. 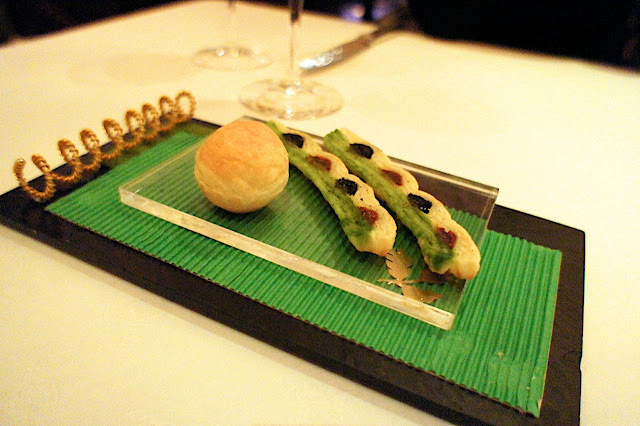 This is something we had at Robuchon HK as an appetiser, but to be served this as an amuse bouche was of a different class. For the third night in a row, we decided against the set menu and went for the nicest looking dishes in the ala carte menu. 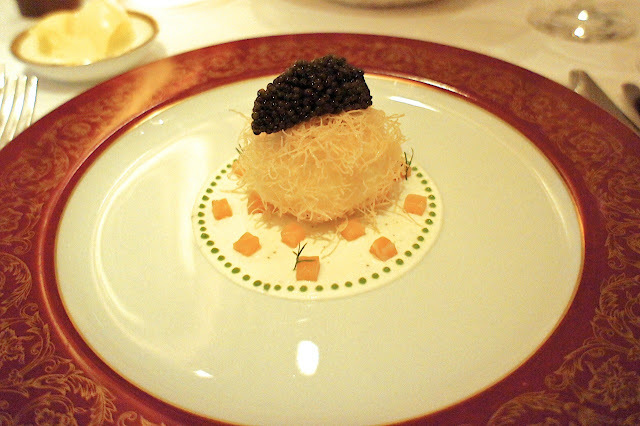 My wife chose the crispy farm egg served with caviar and dices of smoked salmon. 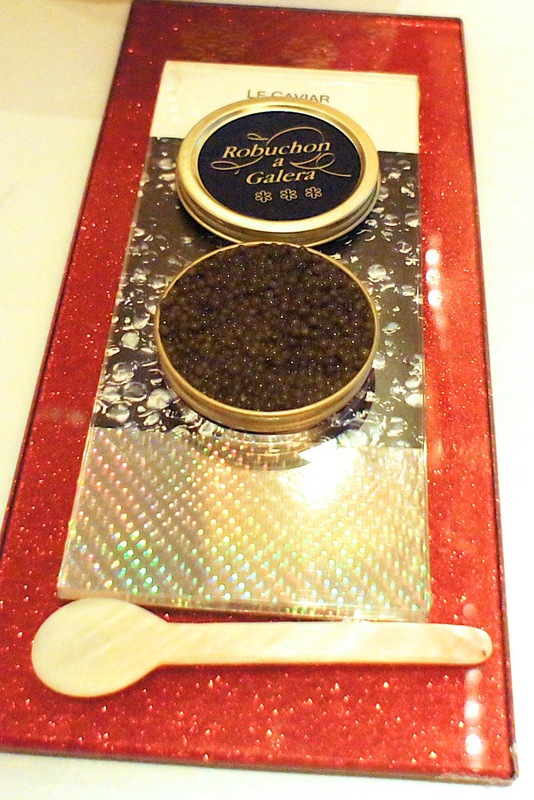 This was something which we had in Robuchon HK last year, but it was slightly disappointing then as the crispy bits were to salty and masked the taste of the caviar (see earlier review: Le Jardin de Joel Robuchon Hong Kong) However, it wasn't a problem this time as the accompaniments were more subtle and brought out the luxurious taste of the caviar. It probably helped that she was given a generous heap of caviar as well. An excellent starter. 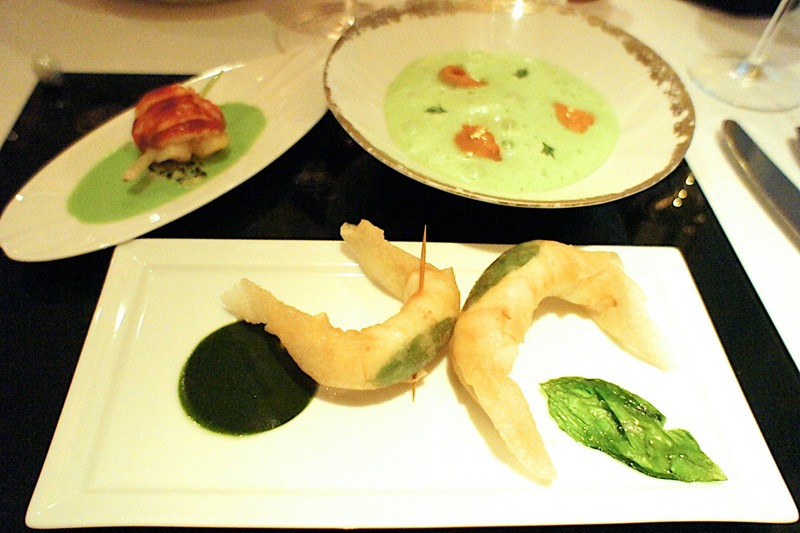 I chose the equally exotic sounding crispy papillotes of scampi with basil, shining sea urchin royale in delicate wasabi emulsion and lemongrass roasted lobster with vegetable cous cous. 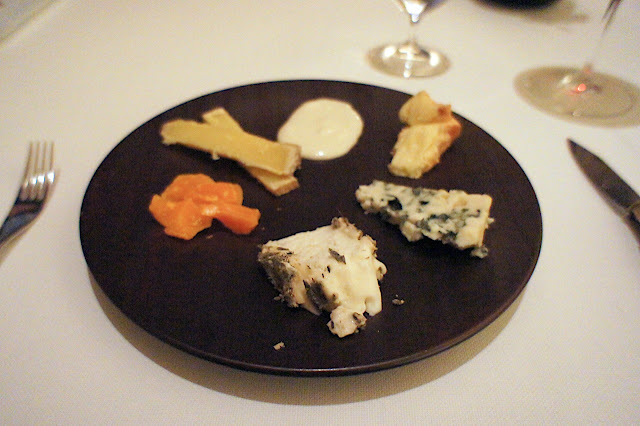 This was essentially 3 different appetisers, and was a substantial course. 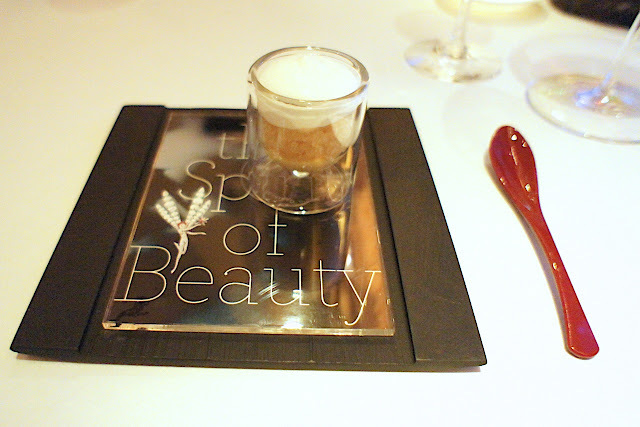 I started with the sea urchin and wasabi foam, which was unbelievable. The roasted lobster was also very very good and the lemongrass added something different to its taste. By the time I got to the crispy prawns, I was already quite full and satisfied! 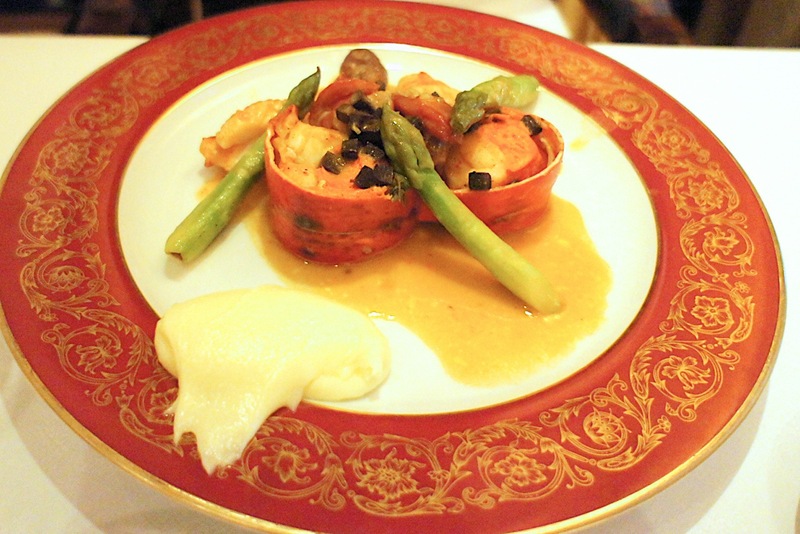 For the mains, my wife went for the Breton lobster baked in cocotte with black truffles and green asparagus. 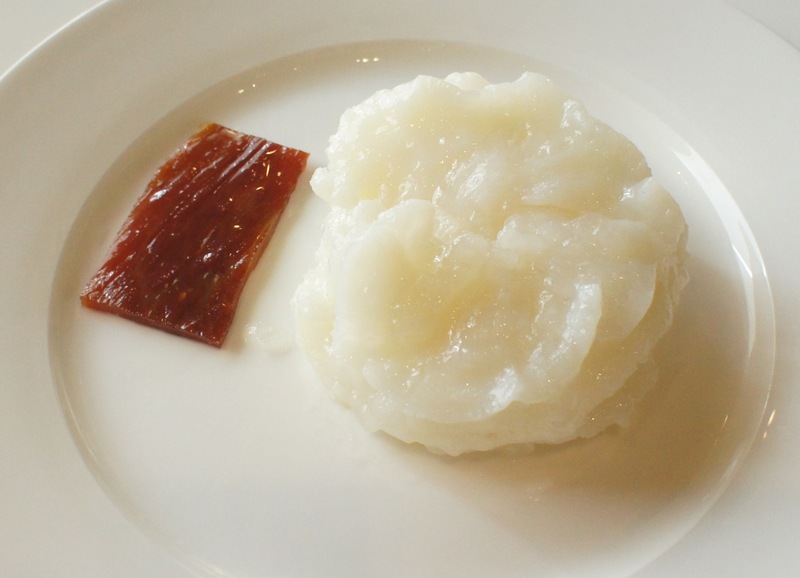 This was cooked in a glass pot, which was taken out and served on the plate by the table. It was a generous portion of lobster, and was cooked to perfection. 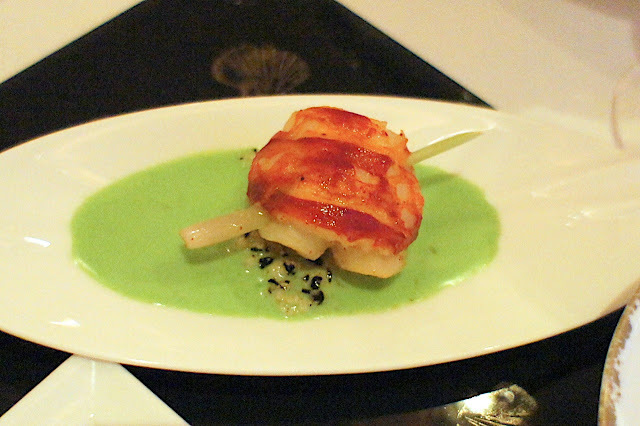 My main course was the pan fried amadai fillet with crispy skin with artichokes in Brigoule style. 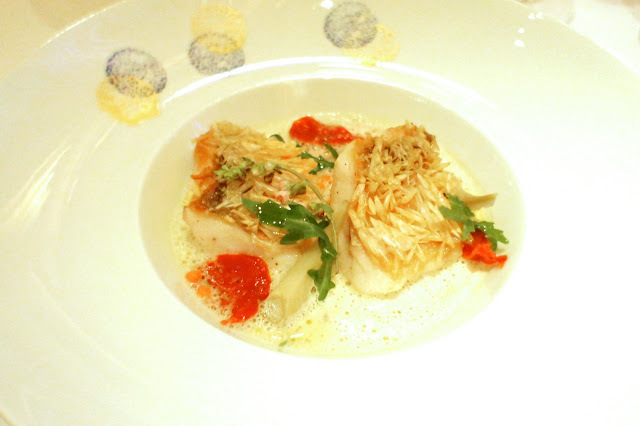 It is something which we have tried at Robuchon HK and really liked, except that this time I got 2 fillets instead of just one. The scales of the fish were fried to a crisp and were delicious. 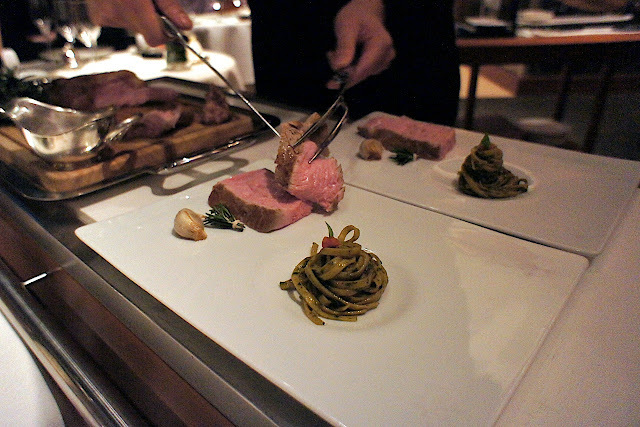 I really enjoyed this dish (which went very nicely with the wine). 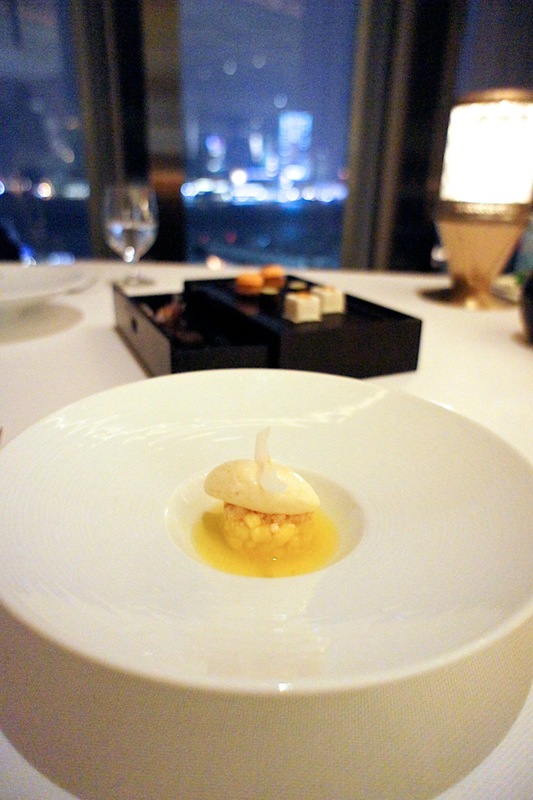 We were then served with a coconut and pineapple palate cleanser before the cheese trolley came by. 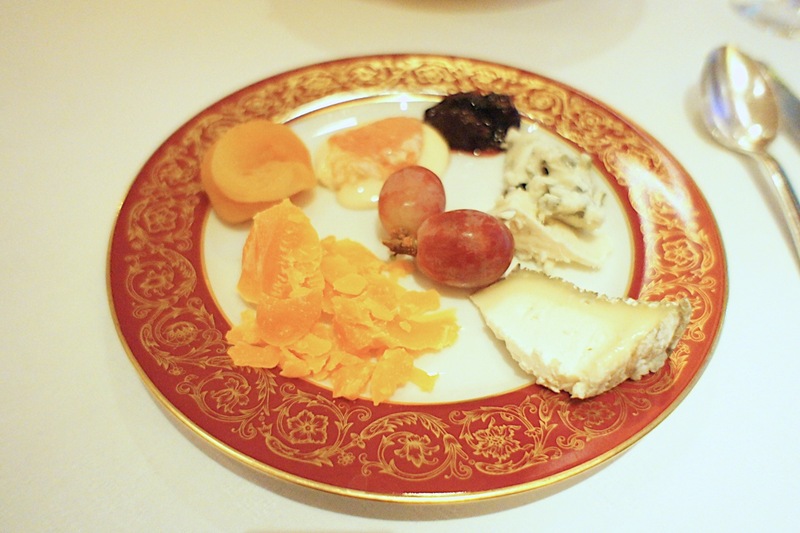 It was the usual selection of French cheeses for us. 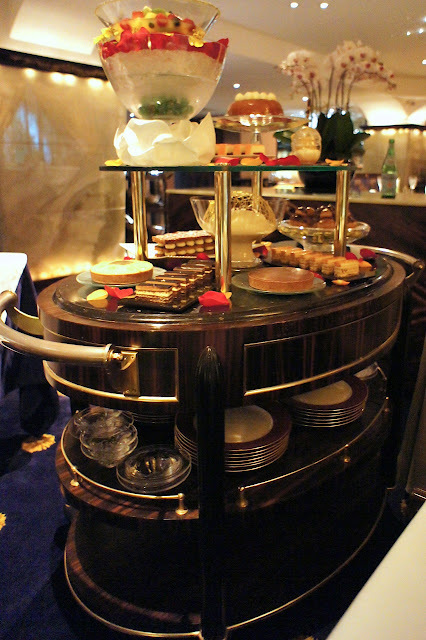 We were quite stuffed by this point and decided to skip the dessert course and go straight to the dessert trolley instead (yes, you can have both the dessert course and the dessert trolley). 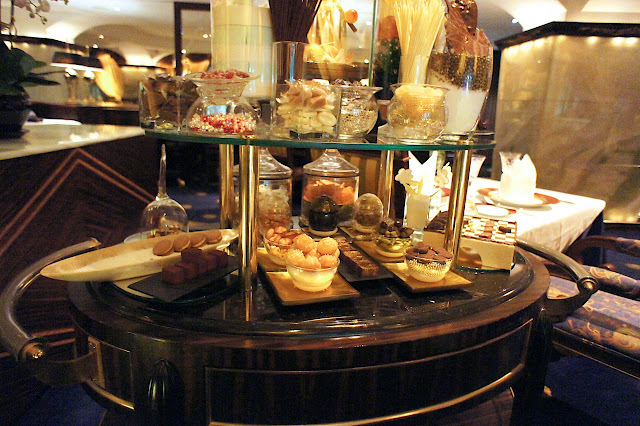 The dessert trolley had a good selection of tarts, cakes, rum baba, chocolates etc. 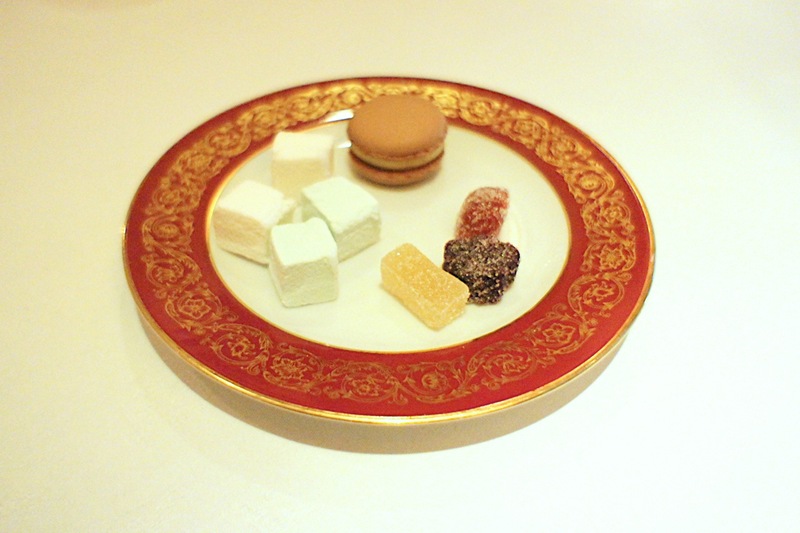 Dinner was rounded off by the sweets trolley. 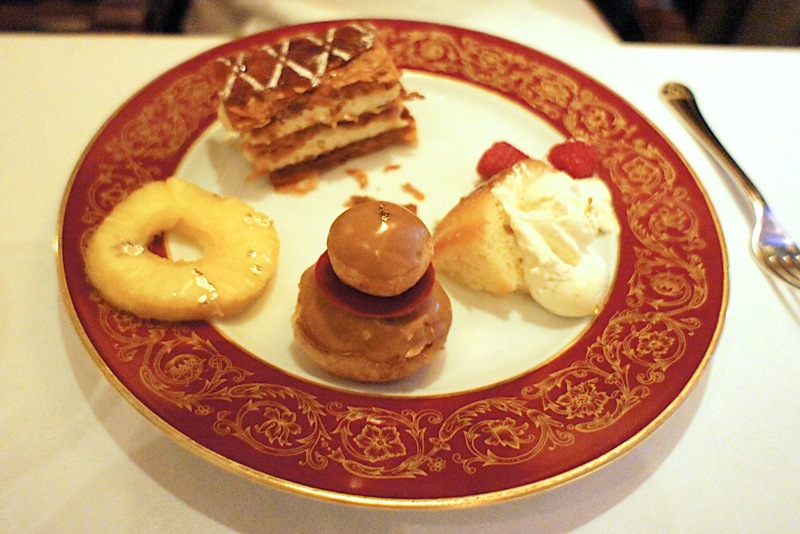 In typical French fashion, main course is just the halfway point of a full dinner and they keep feeding you desserts and sweets until you surrender. Final Thoughts: It was a great dinner at a fantastic restaurant, and everything from the food, wine, ambience and service was of the highest standard. 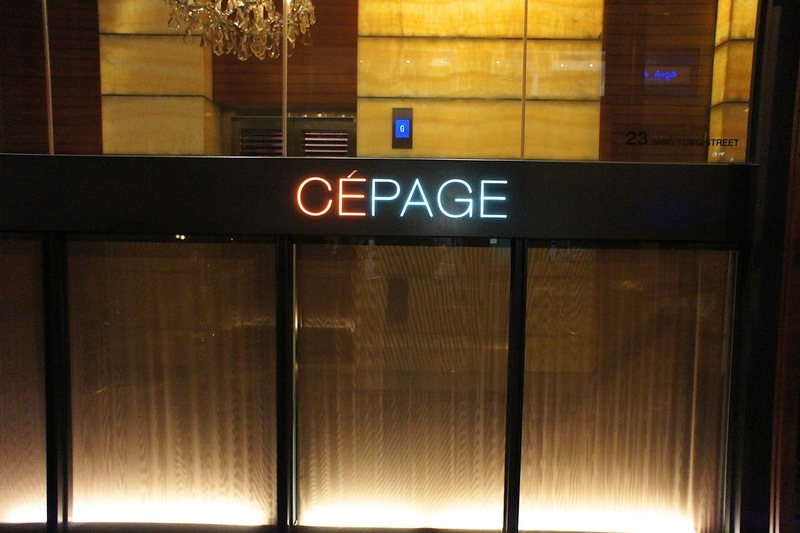 Maybe it wasn't as flashy as some of the newer restaurants but this was one which was very assured of its billing as arguably the best French restaurant in Greater China and one of the top ones in Asia. 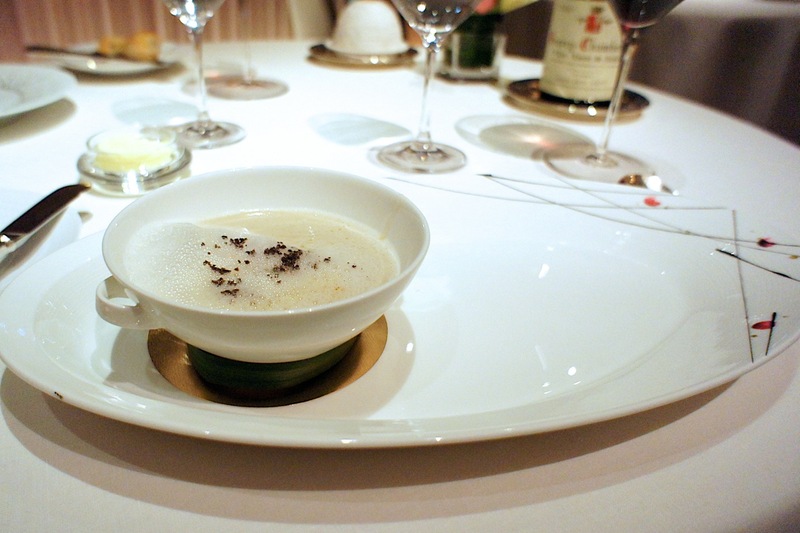 The wine list is worth a visit alone and the service of impeccable (wait staff was attentive without being too pushy). Decor is quite dated but despite the 70's feel, it was discreet and comfortable. 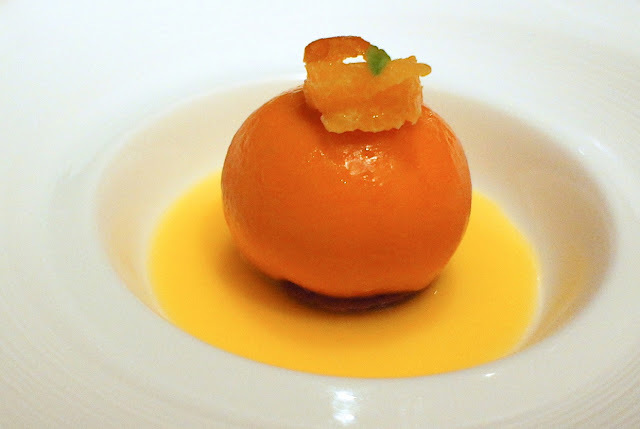 Caprice is a 3-Michelin star french restaurant in Hong Kong, and is located in the Four Seasons Hotel. It is the highest-rated European restaurant in Hong Kong and we came here with very high expectations, especially as we lunched here before several times a few years ago (before Michelin rated the Hong Kong restaurants) and were not very impressed. 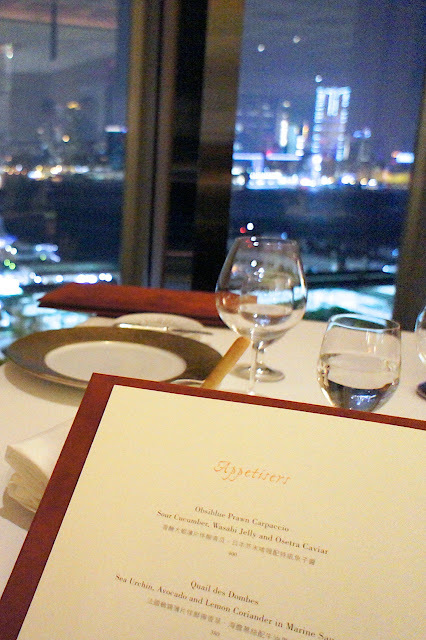 We got a table for dinner and were fortunate to be able to get one with the view of Kowloon and the harbour. At night, this is a great view and for anyone new to HK, it is scenery not to be missed. The dining room is vast with impressive chandeliers, marble floors and gold-plated mirrors, which accentuated the luxury of the restaurant. That said, we did not feel that this restaurant was overly stuffy and self-important (as 3-star restaurants can be sometimes). The clientele was quite casual (some guests were in jeans and one guy was wearing a t-shirt), and the staff members were really friendly and relaxed. We skipped our customary champagne this time as we had been on it the whole day during our time with our 'bubbly' Hong Kong friends (and we were still feeling aggrieved by the exorbitant Krug which we had at Cepage the previous night). Nonetheless, we picked out a 2006 Gevrey Chambertin Premier Cru from J. Prieur which was reasonably priced. 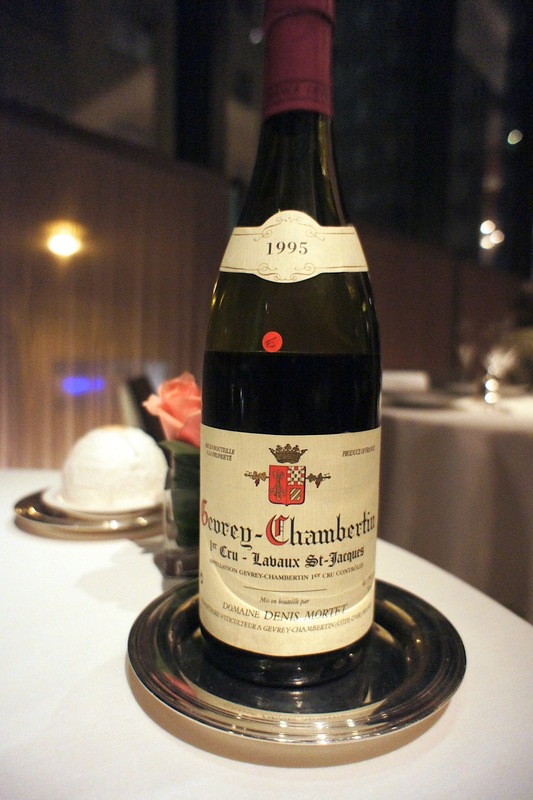 Unfortunately, it wasn't half as good as the 1995 Gevrey Chambertin Premier Cru from Denis Mortet which we had opened the previous night at Cepage. 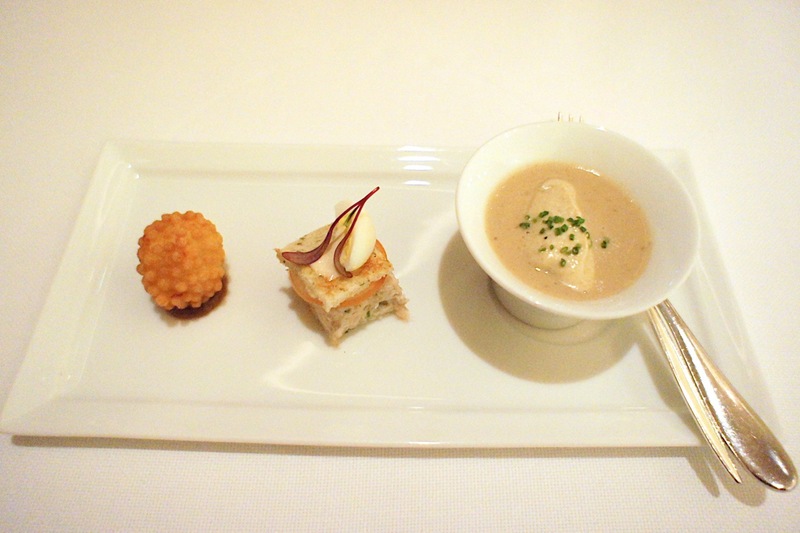 We had a very good amuse bouche of a trio of deep fried potato ball, a mini tuna sandwich and a forest mushroom soup with foie gras (second night in a row we were having foie gras in soup, must be in vogue). 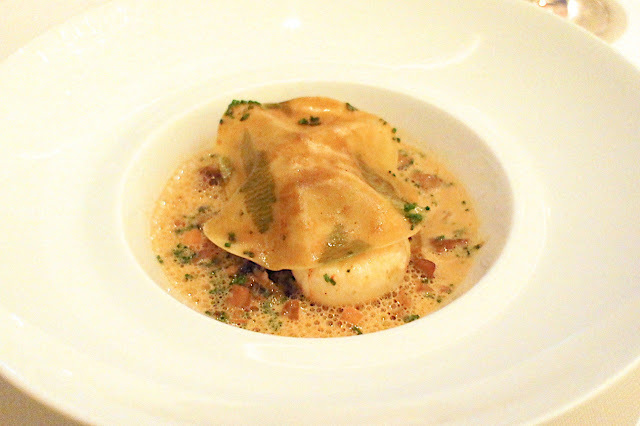 For our appetisers, my wife had the Obsiblue prawn carpaccio with sea cucumber, wasabi jelly and Osetra caviar, while I ordered the langoustine ravioli, veal sweetbread and wild mushrooms in shellfish bisque sauce. Unfortunately at this point, I was interrupted by a work call which required me to step out of the restaurant for almost half-an-hour, during which time my wife had already started on her appetiser before I had a chance to take a proper photo of her dish. According to her, the dish was quite good, but as they were extremely generous with the caviar, she was well pleased at the end of it. 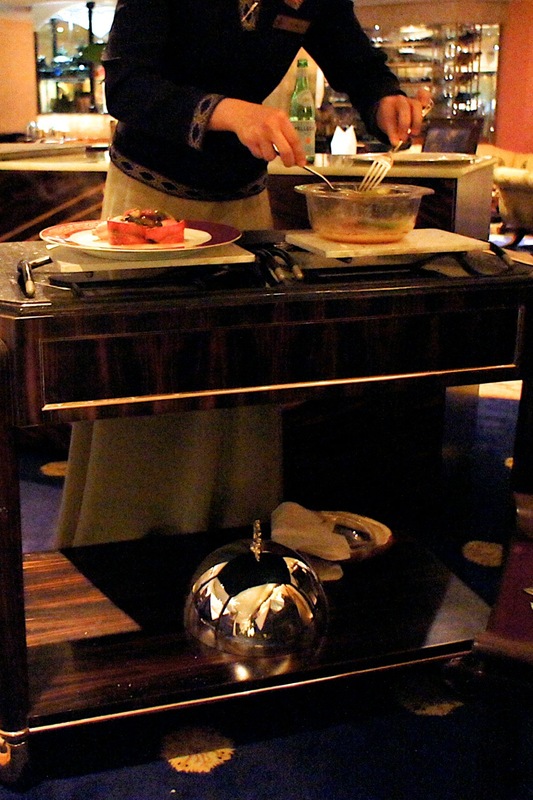 Despite me not being at my table, the staff brought my dish out anyway, which I thought was a bit silly as when I returned, they insisted on taking the dish back to heat up. I'm not sure what the accepted convention for this is, but I would have thought it better for them to withhold my dish in the kitchen till I was back. 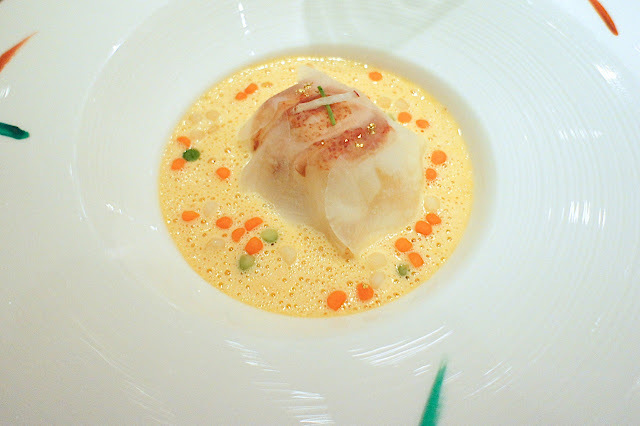 Nonetheless, my langoustine was very good. 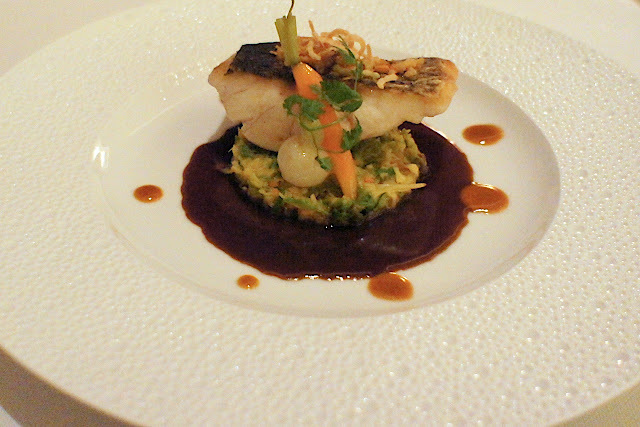 For our mains, we both went for the line-caught sea bass with buttered Savoy cabbage and red wine sauce, which was delicious. The fish was nicely pan-fried and the sour cabbage and sweet sauce complemented the saltiness of the fish well. 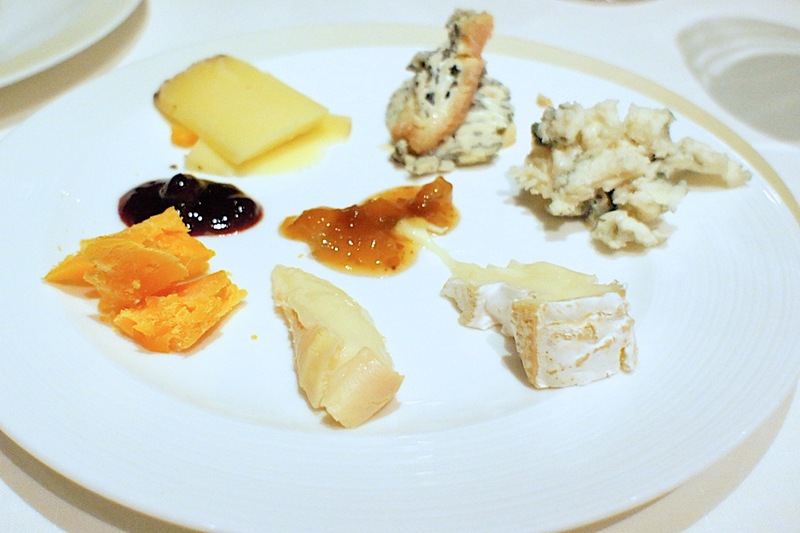 The restaurant had a good selection of French cheeses, and we opted for our usual favourites. We tried something new this time, the munster cheese, but it turned out on our plate funny as it collapsed into a pool of cheese (literally!). We were a bit suspicious of it and did not really dare to touch it. 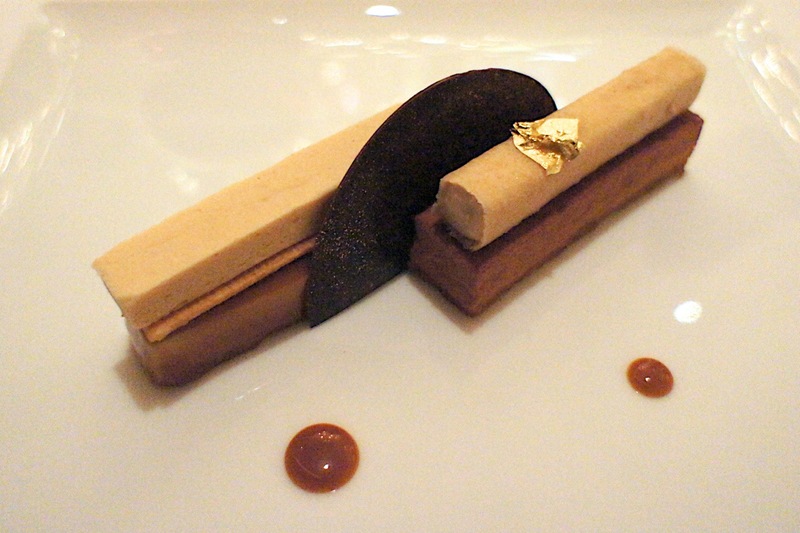 For dessert, we had the Piemonte hazelnut with chocolate and latte foam, citrus nut ice cream, which was very good. Strangely, after our dessert, we were served with another dessert of pineapple sorbet on a bed of pineapple and coconut, which was a fruity and refreshing dish but unusual in that we would have expected this to be pre-dessert served before our chocolate dessert. 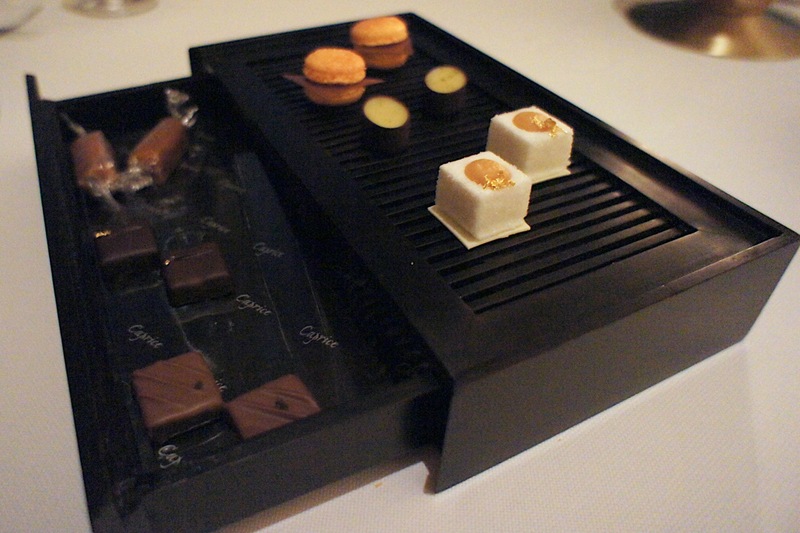 We ended off with a tray of petit four. 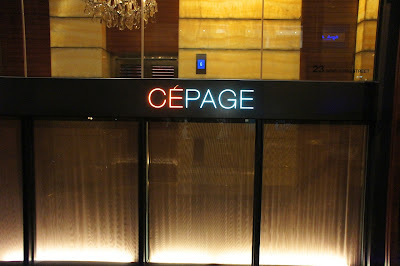 Final Thoughts: In conclusion, dining at Caprice was a great occasion, and we enjoyed it more than we expected (it had improved quite a bit since the last time I ate here). 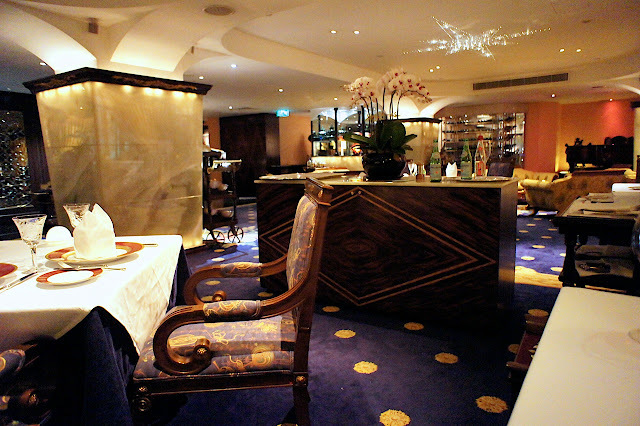 Food was in the classical style, not terribly innovative, but well done nonetheless, and the ambience, the service, the views and the overall feel of the place were top class. It was less pricey than we had expected and the wine list, though moderate in breadth, had a good selection of reasonably-priced wines (relatively speaking).